With the challenges of traditional market saturation, forward-thinking MNOs are diversifying their offerings with broader, more engaged services, which enable them to achieve revenue growth in a non-traditional way. A 5-step MNO Business Growth Model is presented which helps categorise the different ways a MNO can identify and deliver new revenue streams. 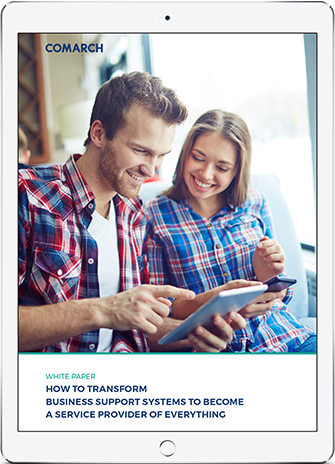 The white paper explores these revenue streams in-depth and backs up the model with case studies and proven real-life MNO revenue growth examples. The world of digital services, IoT and M2M have forced telecom operators to expand their product and service portfolios, which are now often built in cooperation with partners from vertical markets, such as health, automotive, utilities and others. “Service Providers of Everything” must learn how to handle this complexity, as traditional revenue sources such as voice, messaging and data services are not showing enough profit. Many CSPs still depend on siloed, legacy BSS systems, where separate stacks support various market segments (broadband, fixed, mobile, etc.) or various customer segments (consumer, SOHO, SMB, enterprises, etc.). This sometimes means dozens of various legacy systems supporting one telecom business – systems that can and should be consolidated to support modern businesses efficiently. “Openness” is one of the critical requirements for Network Functions Virtualization (NFV), a telecom initiative in which network functions are virtualized and run on commercial off-the-shelf (COTS) hardware. Open solutions significantly increase the number of software suppliers, which in turn increases the rate of innovation. By adopting an open strategy for their NFV architecture, telecom equipment manufacturers (TEMs) can develop new solutions faster, while lowering development costs. In addition, as network infrastructures transform to keep pace with the rapid increase in data traffic from new user behavior and new connections for the Internet of Things (IoT), employing a pragmatic open NFV strategy can facilitate improved capital and operational efficiencies, reducing total cost of ownership.. This white paper discusses the benefits and challenges of NFV, and examines how Wind River® Titanium Server, the industry’s first feature-complete NFV server, achieves an extremely high level of reliability, providing a solid foundation for building carrier grade NVF network equipment, networks, and services.